For the first few parts of this series of articles, I talked about a trope in anime that I call “the token foreigner”, gave examples of said characters, and talked about subsections of the trope in sports anime and in cases where the “foreigner” isn’t foreign. In an attempt to find anime that do non-Japanese characters justice, I have been talking about specific anime in a similar pattern as my regular review articles, but this time through the lens of how the anime represents foreign characters. Last week, I didn’t have the greatest luck with the anime adaptation of Eyeshield 21. This week I’ll be talking about the long running series known as Detective Conan. Also, instead of an opening theme or clip, I’ll put in the main theme music for the series, which to be honest is one of my favorite things about the show. Unlike last week, this next anime does a legitimately good job of depicting foreign characters – the detective mystery-drama series known as Detective Conan . Detective Conan is your generic mystery-of-the-week genre set in modern day Tokyo. 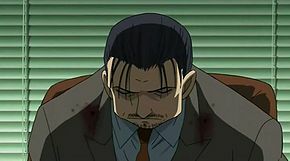 It is about a teenaged detective known as Shiinichi Kudo who happens upon a scene involving an underground criminal organization who attempt to feed him a drug meant to kill him. However, in an added twist, and an added gimmick for the series, the drug instead shrinks him in age to that of a six year old. 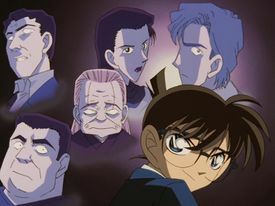 He takes on the moniker of Conan Edogawa and solves mysteries as a child while attempting to solve his own mystery regarding the evil organization and attempting to return to his former age and former life. It is a silly premise, but it is a very popular show in Japan. The series is incredibly long running, having aired for over 20 years with over 800 episodes. And I think it is due to the show’s length and the sheer breadth of its episodes, mysteries, and characters that has lead it to being able to portray foreign characters so well. Being over 800 episodes in length, the show covers many different cases that have been solved by our main character. Most cases are episodic and self-contained – each with its own victims, suspects, and culprits with a passing amount of effort put into their backgrounds and motives. Thus with such a wide variety of episodes, we have many that involve foreign characters. In each case, said foreign character has a different role – some are victims, some are suspects, some are the culprit, and some even help solve the case. Furthermore, many have differing levels of Japanese ability, which affords them more realism than most anime’s portrayals of foreigners. Some characters speak little to no Japanese, some speak it but can’t read or write, and some are fluent. Some mysteries are even a result of linguistic or cultural misunderstandings, often with tragic results. The show even makes an effort to bring up little cultural tidbits such as comparing how teachers grade papers in Japan versus America , or that X’s and O’s means kisses and hugs . Sometimes said tidbits are either outdated or a bit of a stretch, but at least it shows me that some actual effort or research was put into these moments. What I like about the episodes that involve foreign characters is that there is a variety in the characters involvement or lack thereof in the crime. And a variety in whether or not their foreignness is a factor. Usually, the fact that they are foreign is not a factor, and the only time it is is when the crime involves a misunderstanding in culture or language, thereby warning against making assumptions based on national or ethnic background. It grounds the series in reality by showing this variety and not painting any one person or any one culture with a single brush. The following are two cases that stood out to me where a foreign character stood out in the mystery. Our first example is the “Tottori Spider Mansion Demon” murder case (episodes 166-168). The first involves a series of murders linked to a woman’s suicide years before. The culprit in question turns out to be the woman’s foreign lover who she had helped in the past. When they had met, he would communicate with her using Japanese written with the English alphabet, since he could not write in Japanese characters. But it is discovered that upon his leaving he wrote her a small note that had the word “shine” written on it because he wanted her to be his “shining wife”. He meant the letter to be in English, but since she had been so used to writing in Japanese with him, she read it as the Japanese word “shi-ne” (pronounced she-nay), which means “die”. It turns out that this misunderstanding caused her to kill herself, and the murders he committed toward people he thought had contributed to her death were for nought. It was a very tragic story, and a cautionary tale of how language barriers and lack of cultural understandings can sometimes cause conflict. Example number two is part of a larger plot thread titled the “Clash of Red and Black” (episodes 502-503). The second case I want to focus on involved a company man murdered in his office. A witness said the culprit was foreign, however many English-speaking foreigners had appeared in the office that day, so all were gathered to try to find the true culprit. The victim wrote a note on a memo pad in English before he died, and since the culprit attempted to get rid of the note it was thought that the message was a dying message leading to the culprits identity written by the murder victim. However, it was found that the note did not have something incriminating on it – it was simply “bring my tux”. So the real mystery was that why would an English speaker think that such a note would incriminate them, and why would they try to get rid of it? The answer ended up being that the culprit was not actually foreign – he was a Japanese citizen born to foreign parents and knew no English. He only suspected that the memo pointed to him and so removed it just in case. It was a very simple mystery, but a rather astute commentary on culture and race, and how it is perceived. These examples are just one-off episodes with one-off characters, but the series also has many reoccurring foreign, or part-foreign characters. There’s the half-Japanese scientist Sherry , there’s the mysterious and morally ambiguous villain Vermouth, there’s the British secret agent James Black , and there’s the American FBI agent posing as an English teacher Jodie Starling. All of these characters are very important to the overarching plot and are involved in a lot of Conan’s cases, but the one I want to focus on is Jodie Starling. Jodie’s initial run in the series as an English teacher was a real delight for me. 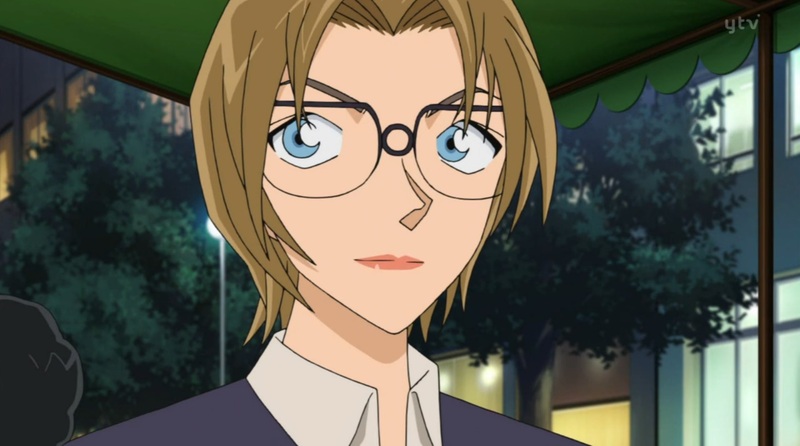 As an English teacher teaching in Japan myself, I was pleasantly surprised to find someone I could so easily relate to personally in a Japanese anime. Though she is a bit of a mystery herself during her first arc in the series, the little moments where she is seen interacting with her students are fun. It not only humanizes her and adds to her personality, but that the expectations that her students have of her which are based on her foreignness, literally echo reactions that I’ve had from my students. For instance there is a moment where her students are talking to each other expressing disappointment at her not being as “weird” as they thought or “not telling as many jokes” as they thought – things that, as we have seen, Japanese media depicts as common traits for foreigners. Jodie reacts to her students confusion and cultural misunderstandings with clever or playful responses, which both challenges the viewer’s notions of how a foreigner acts and adds to her coy nature. Other little details about Jodie that are shown throughout the series, from her love of video games, to her enjoying a good drink, to being clever enough to match wits at times with the show’s main character all add up to a surprising amount of character development that is rarely afforded to side characters, much less foreign ones. She’s good with fake guns, and real ones! On top of that, Jodie’s Japanese is fluent, yet to keep her identity disguised and to make others underestimate her, she often speaks in an over-the-top foreign accent. When there are times she doesn’t want to deal with someone or when she has to mask information about herself, she pretends she doesn’t understand Japanese . When Jodie gets serious and she is on a mission, she drops the silly foreigner act, but still manages to be her confident and fun-loving self. Though it is annoying to hear yet another awful accent coming from a foreign character in an anime, this one at least has a purpose behind it. The accent isn’t there to make a fool of Jodie, it is to make a fool of those believing in it. This is an important distinction to make and deconstructs the foreign accent trope seen in anime. Whether it is a side-character a one-off character, or one central to the plot, Detective Conan has managed to show a wider spectrum of respectfully portrayed foreign and half-Japanese characters than most other anime combined! A large part of this is because its length allows for a greater chance at hitting the right mark. But the fact that so much time and effort is put into respectfully showing non-Japanese characters, should really be praised. I wish more anime would learn from this show, and include foreign or part-Japanese characters that go beyond their token gimmick. As with any character, the person’s background should be addressed, yet not be their defining feature. Like with any character, I want personality, backstory, and to have them feel like a human, not just be defined by the way they look or the language they speak. While Detective Conan‘s supporting cast contains some unique examples of foreign characters, the next and last series I will be covering next week has the most diverse cast I’ve seen in an anime, and that is Cyborg 009. The series is known as Case Closed in English, but like most of my articles on Japanese anime, I chose to refer to it by the Japanese title because I am more used to the Japanese version. Whereas most people from the US understand a check mark to be correct and a circle on a test means that the teacher wants you to look over something that is wrong, in Japan a check mark denotes a wrong answer while a circle means a correct one. This is not a commonly known convention in Japan. I’ve mentioned Sherry in a previous article. His name is a play on James Bond. In reality Jodie’s voice actress is Japanese, and she is actually pretty poor at English, which leads to some comically awful moments when Jodie actually uses English in the series. At least, they are comically awful to me, an English speaker. In the series, it is played with a straight face. If there was anything I would change about Jodie, it would be that I wish they got a fluent English speaker to voice her.